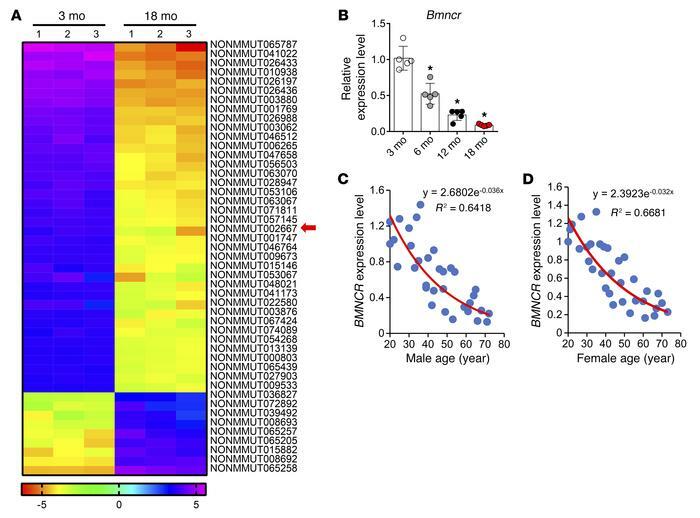 Bmncr expression in BMSCs decreased during aging. (A) Heat map of microarray profiling results of deregulated lncRNAs in BMSCs from young and aged mice (fold change > 3, false-discovery rate < 0.20). Red arrow indicates the lncRNA (Bmncr) selected for study. (B) qRT-PCR analysis of the levels of Bmncr expression in BMSCs derived from the mice at different ages (n = 5 per group). (C and D) Age-associated changes of BMNCR levels in human BMSCs from 32 males (C) and 32 females (D). Data are mean ± SD. *P < 0.01 (1-way ANOVA).